I think we will all be making a lot more gifts this year with the present state of our economy. I don't know about you, but our budget's pretty tight these days. These felted and stitched wool ornaments are a fun economical gift to make. 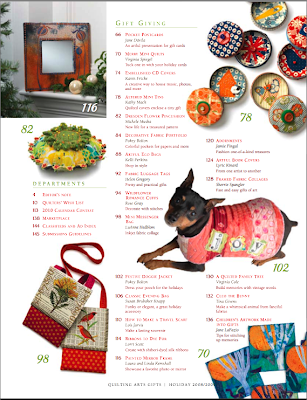 You can find the directions in the new Quilting Arts Gifts and if you are in Houston for International Quilt Festival at the end of the month you can take a workshop making them with me in Make it University. You can't get a better bargain than the Make It U workshops at $10 each. I will be teaching two workshops at Make it U this year. The first one will be Friday, October 31 at 3:00pm and the second one will be Saturday, November 1st at 10:15. 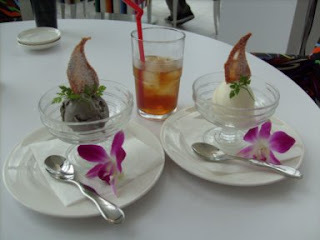 Experience all the fun adventures of an artquilter going to Japan and Korea by reading my friend Frances' blog. Frances is on her way to Korea for a Peace Corp reunion, but she is taking a short stop over in Tokyo. Frances is shopping the districts of Tokyo with our dear friend Yoshiko who returned to Japan several years ago after living in Austin TX where she was a member of our artquilt group. Next, Frances will head to Korea and hit the bead, button and notions stalls in the marketplaces of Korea. She is meeting Aussie art quilter Lisa Walton who will also be in Korea. Imagine the damage they are going to do. This is so important, evidently 4 out of 10 women are not registered to vote in the US. If you have not registered please register here and help us change the direction of this countries politics. Remember – friends don't let friends get to November 4th without being registered to vote! 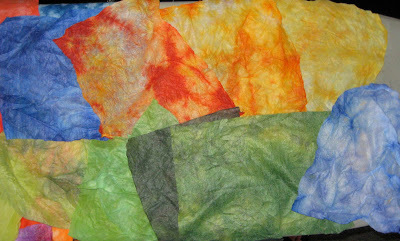 A month or two ago I mentioned that I had done a project for RIT dye for Quilting Arts TV. I actually made three projects for the RIT representative to use on the show because I had too many different ideas to stop at one. They taped the show at the end of August and it will air in Series 300. I have heard it will be on the same episode that I taped last spring at quilt Festival doing the Fiesta Ornaments. 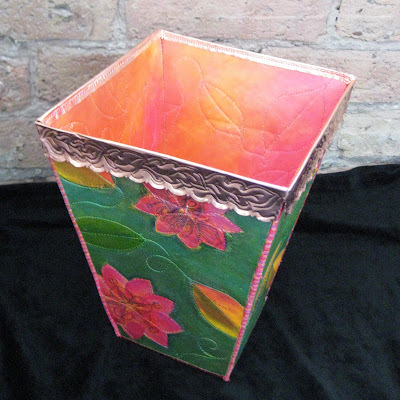 I would love to show you more but you will have to wait for the show or pics in Quilting Arts magazine. I never used RIT dye before doing this project, I had no idea what the colors would be like or how to dye fabric with it, I have always used Procion. I think I was imagining that I would get dull 1970’s colors, you know dusty mauve, blue gray, goldenrod. I was really surprised by the colors that I got when I adapted it to a low immersion dye method, dyeing pieces of fabric in small containers of dye. These are all the RIT dye colors. one cup hot water to 2 tsp liquid dye or 4 tsp powder dye and one minute in the microwave. 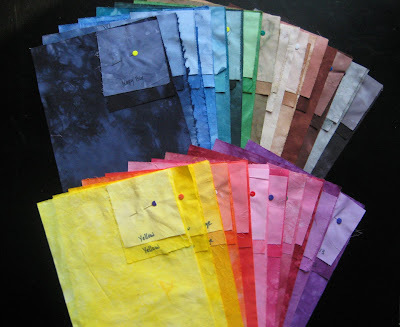 Increasing or reducing the dye quantity will make colors more saturated or lighter. This quantity of dye solution will dye up to a 1/2 yard of fabric or roughly a fat quarter of cotton batting. I am writing an article about it now that will go into a lot more detail about the process. One of the things that intrigued me about RIT was that it could dye some man made fibers. It won’t dye polyester but it will dye nylon, so the soft Pellon interfacing can be dyed, just don’t put it in the microwave, it will melt. This is how it looks. I used the interfacing on two projects. I ended up melting a lot of the interfacing during my experimenting with dyeing it, so I didn’t have a lot to work with for the projects. I found if you put the interfacing in the hot water dye solution and leave it there for a couple minutes, that is enough to dye it. 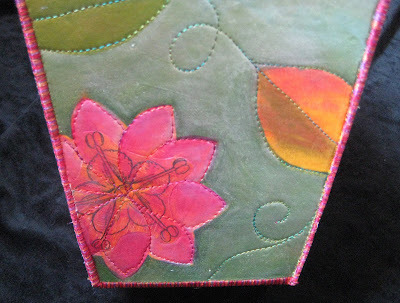 I made one piece fusing the interfacing to batting to make details on flowers and leaves and another piece that is abstract working with layers of batting and interfacing. This was a really interesting project to do. I found there are definitely times when the speed and simplicity of using Rit comes in handy, not to mention the fact that it is non-toxic. There are also times when I will opt for using Procion. Each product has its benefits and drawbacks. I think a lot of people are uncomfortable using fiber reactive dyes for a number of reasons and RIT certainly provides a viable option for artists to use instead. 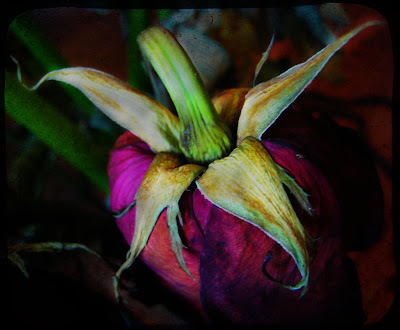 Using Photoshop I cropped the photo, created two duplicate layers of the image and made adjustments to each. I increased the saturation, adjusted the contrast, selected individual colors and adjusted them for color and saturation, then erased parts of one layer to reveal parts of the other layer. With this photo I created two more duplicate layers and made one layer a sepia tone. Then I selected the eraser tool with reduced opacity and removed the top layer partially to bring up subtle color from the image below. 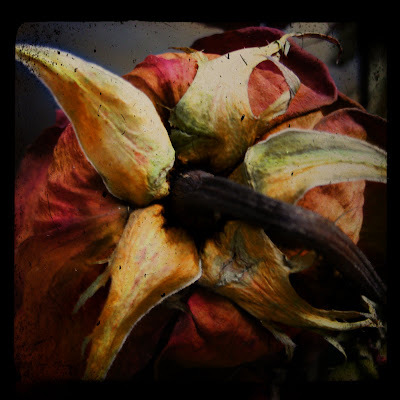 Then I added a vintage camera lens filter and multiplied the image. 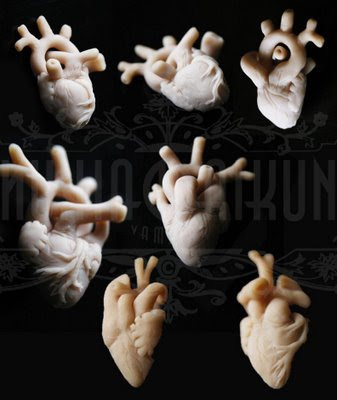 My daughter Nina has been making Sculpy hearts. They range in size from about 3/4" across to 1 1/2". I think they are so cool. 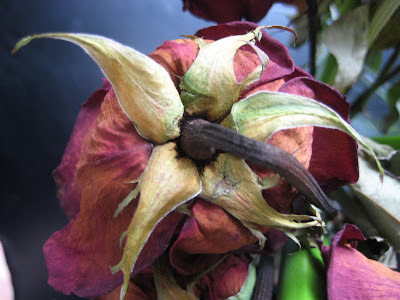 Sometimes I think flowers can be more beautiful as they droop and dry out, curling, twisting and changing color. This is a beautiful new knitting magazine to hit the store shelves. I found several patterns in here I would love to knit. Interweave knits has been one of my favorites for years, but the majority of the knit wear in the last several issues have not appealed to me at all. Frankly many of the patterns have looked dated to me, in a 1970's kind of way. The premier issue of Debbie Bliss Knitting Magazine, published by Vogue knitting, is beautifully designed with gorgeous full page photos of the projects that are in a variety of skill levels. There are sweaters for women and men, projects for the home and a collection of sweet baby blankets. From what I understand this magazine will only publish twice a year. I look forward to the spring and summer issue, but for now I will have plenty to keep me busy with this one. I just love these two sweaters. After making the first vessel I realized that I needed to change a few things in the construction process. I used a fused hinge method to put the base on this new vessel. This was the method I used making the Dream Houses. It made construction much easier with less bending of the panels when sewing the sides together. I was anxious to try out this shape so I used simply painted fabric to see how it would go together. 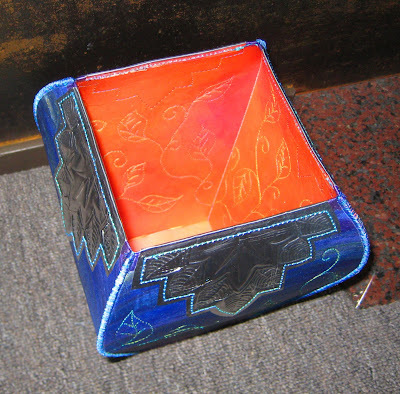 For the inside of the vessel I painted the fabric using a paint called Polished Pigments. I wish you could see the luminosity of it in the photo, it is bright and coppery. This is a new paint that comes as a powder that you mix with a paint medium (Simple Solutions; one bottle for fabric another for paper). It is so metallic and bright, it literally looks like car paint. I saw Bernie Berlin using these paints at the Chicago IQF show last spring. 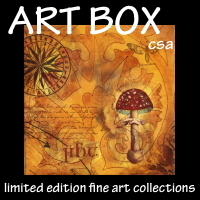 The color glows, it is beautiful, but the base has a very different consistency than other textile paints. 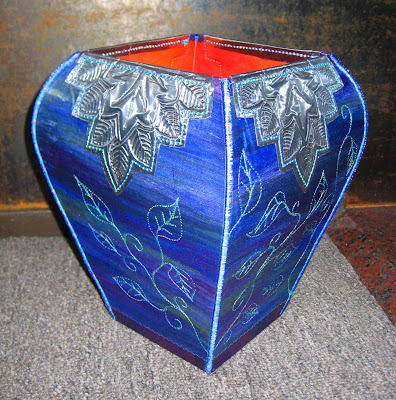 The outside of the vessel is painted with Jaquard Lumiere's. I like this shape. Now that I have a few more construction details worked out I want to try some more, but I am going to have to stop for a while and take care of a few other projects that deal with writing, dyeing and color. 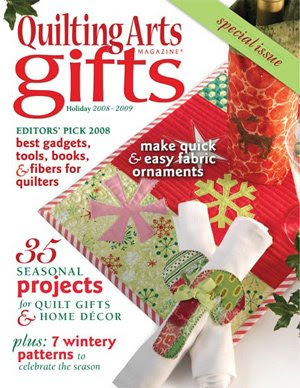 Remember last years Quilting Arts gifts? This year the gifts issue is bigger and better than ever. It is packed with great projects. 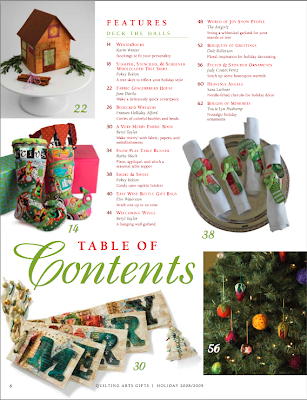 Look at that table of contents, two pages of holiday goodness! 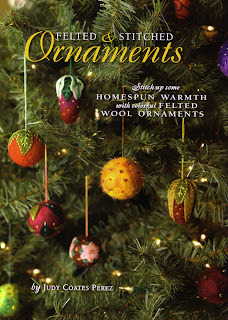 I wrote an article for making my felted wool ornaments. You can see them hanging on the tree in the photo in the bottom right corner of the first table of contents page. Look at Pokey's adorable dog in that pink jacket, too cute, and I love LuAnne's awesome messenger bags, in the bottom left corner of the second page. Don't you want one of those? 3 months until Christmas doesn't seem like enough time to start whipping up all those handmade gifts, cause it looks like there are a lot of good ones in here. This issue will be on sale in the stores starting September 15, but I bet we'll find it in some places before that. For sometime I have wanted to try making some vessels. I have several ideas I want to explore. Besides trying different shapes, I of course want to include metal. I suppose it would have made sense to make one without adding metal first to try and work out the logistics of how to put one together, but I always want to do it all, so before I begin I just think it through as far as I can and deal with technical issues as they come up. One thing I learned making this was that the copper metal is much harder to cut than the aluminum or pewter. My decorative scissors did not like cutting the edge on this. The second problem was realizing I could not stitch the seam all the way to the top with the copper stitched all the way to the edge. 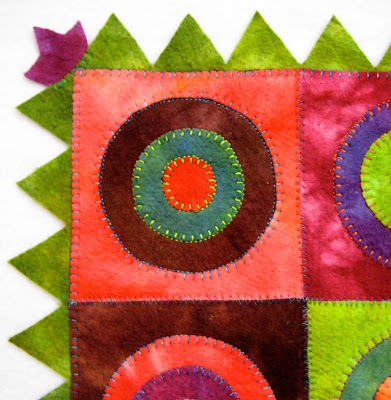 It is too hard to stitch through two layers with the added bulk of Peltex. 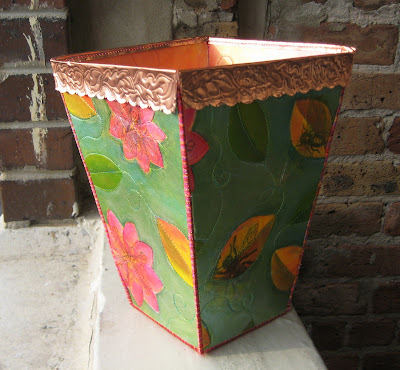 I used my mixed media painted fabric technique to make the fabric for the vessel. 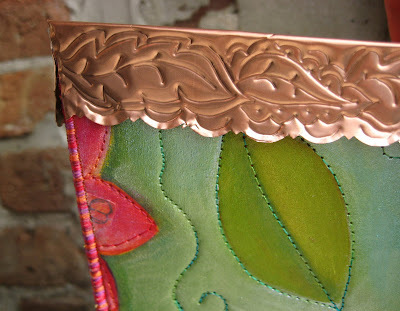 I love the combination of the soft green metallic paint with the copper. 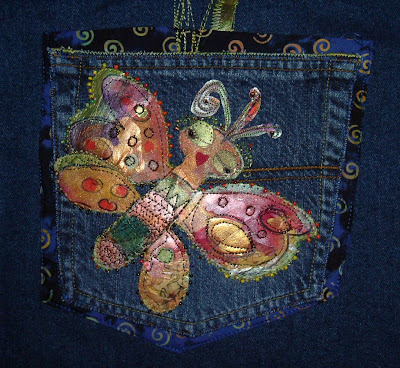 I just received a wonderful email from Marty Young, who was a student in my Mixed Media Painted Fabric workshop in Atlanta. Look at the fabulous project she made using her fabric. 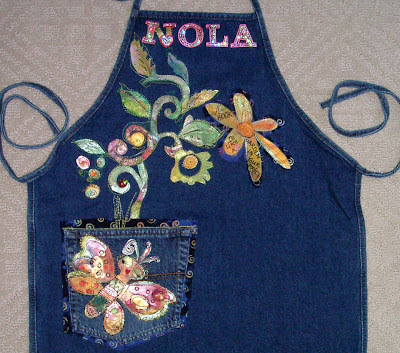 Marty says "I made an apron for my loyal guild library assistant ...using the mixed media fabric for applique and fusing and machine stitching it onto a pre-made denim one...beading the butterfly was a little tough (the denim was thick also)....but all sorts of new ideas have flooded my brain for future projects." I am thrilled when I see students who take work to the next level and make it uniquely their own. Bravo Marty!